Question to throw out there: If a new coach is sought out, is it better to go for someone with a UP connection (over, say someone who may be more qualified but has no historical ties) or to make a clean cut and "start over" with a complete new mindset/culture/environment (is our historic lack of success too much baggage)? I see arguments for both. My thought on whatever happens this offseason boils down to the old saying: "If you keep doing what you have always done, you are going to get what you always got." Either the coach needs to change or Rev/the program needs to change. I wish Spoelstra was more involved in the program. I realize he is quite busy, but I do not get the impression that there is much of a connection these days. I know there are NCAA rules around this sort of thing, but having him as an ambassador to the program would be invaluable. How about a couple TV interviews with him wearing a UP shirt? Maybe drop the UP & coach name here and there...? As for the what could have been comment: I agree. I also think about what could have been if Voldy would have been granted the missed year of eligibility. We sure could have used him this year! Yes, I too am in the "Keep Reveno" camp for a number of reasons, but primarily because he fits UP's culture in all respects and is the hardest working guy I've ever observed outside the military. With that said, because of Rev's lack of wins there is always going to be speculation about his future and that of his assistants until some on-court success is attained. (Speaking of assistants....from my perspective, Coach Brown was a wonderful font of knowledge and stories when he was informally advising Rev, but once he was actually an assistant coach it was pretty obvious that his style and Rev's style were different, and Herb just didn't feel as though he was being "heard" by Rev and some of the players. IMO, it seemed Coach Brown was very frustrated with his lack of "say," and moved on). What I find frustrating is not the coaching, but the recruiting. Without naming names, there have been some recruits that have been real head scratchers, and I know my frustration with "project" players is shared by others. DTL mentioned the loss of Eubanks to OSU, but he matured, was noticed by Pac-12 schools and saw an opportunity that most of us would have taken. The tall man (not big man) Joseph Smoyer, coming in this summer may have been signed EARLY by UP just on the off-chance he too would mature and look elsewhere. He is skilled, with good foot work and a nice touch, and he does have broader shoulders than Philipp, so maybe he'll get bigger, but IMO he is another project. The mention of Smoyer leads me to another pet peeve of mine, the lack of redshirting for maturity at UP. Coach has always left it up to the individual player to decide to redshirt or not, but there are just so many positives to redshirting a freshman (body, skill, academics) I just don't see why it isn't done. Sure, other schools may have more bench depth than UP, but a HUGE part of GU's success has been redshirting freshmen and acquiring mature and skilled transfers....as I recall they currently have 8 redshirts and 5 transfers on the roster. No doubt there will be at least one or more transfer this spring, so scholarships could open up, but again, my concern is not the coaches, but the recruits that come in. I also think we'll see a marked improvement in Ray and Jarrel next season as it often takes a year for JC guys to adjust to the quicker, team-oriented D1 game than some realize. I do not see Philipp reaching D1 quality or weight, but we shouldn't stop hoping. If a staff change is made, I do not see an NBA type coming in. As I've speculated before, it would have to be someone with head coaching experience who is an easy fit with UP's culture and who has a track record of recruiting student-athletes who are good in the classroom and excellent on the court. Hmm, that sounds a lot like Rev, except UP fans crave more on-court success than we've seen. Walters is finally out at USF. Like Keating, his record was demonstrably better than Reveno's (roughly a 50% WCC winning percentage for Walters, compared with about 33% for Reveno). With Keating at SCU and Verlin at Pacific, that makes three WCC coaching changes already. If Reveno is retained, he lives a charmed life indeed. Yup, our boy Rex is out at USF!! With Keating and Walters gone, who will I have to yell at during games They were my two least favorite coaches in the WCC, by far. I feel confident neither coach was fired because of their W/L record, but more about the culture/atmosphere of their respective programs. I think most of us knew Keating would be gone as he was not well liked by the SCU administration, and when the new AD came in it was just a matter of time before Keating was out. I would imagine opposing fans were not the only ones who wanted Walters gone, and not just because he's a jerk, but because of the turmoil that seemed to surround his program. I think he coached 8 years on the Hilltop, and during that time there were at least 20 players who defected before their eligibility was done. Sure, more kids transfer these days, it's just the current culture, but at USF it was not about looking for better opportunities but more about "let me get away from this guy." I will miss them both, as I will have to find someone else to shout at during games. Hmm, maybe I should finally start in on Bennett.....he's an easy target, but he's so danged successful it's difficult to question is antics. Surprised to see that USF let go of Walters. He definitely seemed like a difficult personality, but it did always seem like his teams outperformed expectations and their talent - something I think can likely be ascribed to coaching. That said, USF wasn't exactly setting the world on fire either, so I guess I can understand it. Keating makes more sense to me... I never felt like his SCU teams were as good as they could have been. As for us, I'm way too close to the situation (I don't work there anymore, but did for a long time) to say much other than I have great respect for the staff and really admire the work they have done at UP - both in terms of bringing us the type of success on the court we haven't seen in a long time and in an impeccable record when it comes to academics and running a clean program. Clear that the high point came in 2008-2011. I think it's fair to look at reasons why that was and how we can get back there. Too bad Luke Sikmas, Jared Stohls, Robin Smuelders's, and TJ Campbells don't grow on trees. PilotNut wrote: I wish Spoelstra was more involved in the program. I realize he is quite busy, but I do not get the impression that there is much of a connection these days. I know there are NCAA rules around this sort of thing, but having him as an ambassador to the program would be invaluable. How about a couple TV interviews with him wearing a UP shirt? Maybe drop the UP & coach name here and there...? I think he has done more than you might realize... I know he has visited (privately, so no media or anything) with the UP coaches. He has also appeared several times in UP TV commercials and print ads. All that to say that, sure, it would be awesome if he did more, but he has actually been pretty generous with his time. And that barometer says... Out of 10 years, 2 with winning records and top-half finishes. In 2002 there were 327 D1 teams; 2016 indicates that 351 were rated. Under Holton in 2002, Pilots were rated 266, in 2003 200th, in 2004 157th and in 2005 217th. Reveno's teams are similarly rated in the last two years of the program, perhaps not so supportive of his retention. I looked up Holton's termination date: Friday, March 24. Reveno hired on April 10. I do not know if that provides a useful timeline given the change in administration, but we obviously have not moved as quickly as our WCC brethren. Obviously I hope Reveno gets brought back and the team's performance improves next year and we delay the likely chaos and regression of a change for a period of time. Oregonian wrote: Reveno, 48, had multiple years remaining on his contract, but the university also had a low buyout attached to his contract. In his nine seasons, Reveno is 128-158, and has graduated 100 percent of scholarship athletes. Last year's March 26th probably equates to this year's March 19th due to the basketball season being moved up a week because Easter is so early this year. As some may know, when UP's current AD was employed at the WCC he was behind the public reprimand and suspension of Coach Walters for the first WCC game of the 2011-2012 season due to his boorish behavior. PilotNut wrote: Question to throw out there: If a new coach is sought out, is it better to go for someone with a UP connection (over, say someone who may be more qualified but has no historical ties) or to make a clean cut and "start over" with a complete new mindset/culture/environment (is our historic lack of success too much baggage)? 1) Coaching experience. I think this would be evaluated on a case-by-case basis. Hard to know how to compare head coaching experience at a lower lever, for example, with assistant experience at a higher level. 2) High degree of self-critique (knowing and becoming aware of one's own weaknesses) and commitment to implementing strategies for self-improvement. This informs choices for assistants, and also guides professional-development efforts once on-the-job. 3) Portland-area and/or Pacific NW basketball cache: Someone who recruits, local sports fans, and local youth coaches will be excited about. 4) Commitment to uphold the University's standards for academics and character as part of the culture of the program. Hmm, you know you just described Coach Eric Reveno, don't you? I'm not so sure SCU and USF will be looking in the same talent pool as UP, but IF there is to be a move it should come sooner than later. As far as #3, for me that is not a criteria....I believe it is much more important to have a nationally/internationally known name for the recruiting connections and tips than a local connection. Local ties will be developed, but at least one assistant should have a solid western US background. I sure am going to miss you yelling at Rex all game. 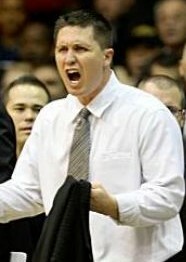 DD wrote: With Keating and Walters gone, who will I have to yell at during games Question Question They were my two least favorite coaches in the WCC, by far. I noticed Randy was getting on your nerves a bit when they were here this year. As long as we're throwing names out there. Damon Stoudamire? He's an assistant at Memphis for the second time. Perhaps he wants to come back home. He won't have any marijuana possession problems in state anymore. So long as he doesn't try to take it across state lines... He does seem to like going back to places he has been before. Coaching @ Memphis (NBA) after being a player for the Grizzlies, then returning to Memphis (NCAA) after a stint coaching at Arizona where he played. Why not back to Portland again, this time as the Pilots head coach? Does UP provide the coach a car as part of the contract? If so, can it be a yellow hummer for Stoudemire? I mentioned Stoudamire earlier in this thread, along with the guy who would be my first call if I were AD: Terry Porter. I saw Terry and his son at Chiles a time or two this season. NoPoNeighbor wrote: I mentioned Stoudamire earlier in this thread, along with the guy who would be my first call if I were AD: Terry Porter. TP briefly attended the Pilots pregame reception in Las Vegas, but I wouldn't read anything into that....IF there is a change, I just don't see UP going pro. I guess another consideration to make regarding contracts and buyouts would be: is our coaching situation so bad right now that it would be worth paying Reveno to not coach? I just don't see our department being flush with the cash necessary to do that.